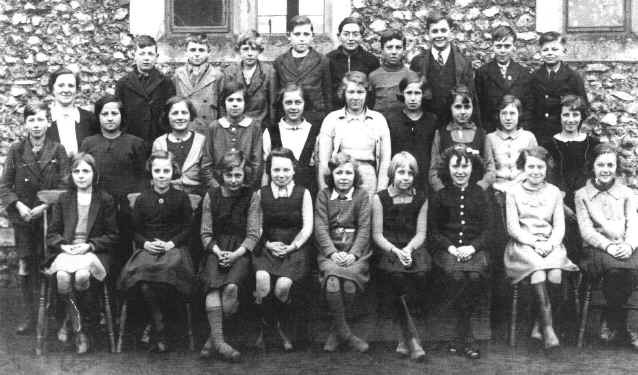 Miss Beryl Addison (teacher) on left. Middle Row: Rex Birch, Mary Whitehand, Jean Cooper, Betty Vale, Betty Edwards, Barbara Moreton, Elsie Johnson, Sylvia Eyres, Ada Secker, June Curtis. Front Row: Molly Fairbrother, Jean Morley, Jean Fletcher, Marie Wortley, Doris Wright, Barbara Collins, June ? (lived down the Southery Road), Pearl Everett, Dorothy Wright.